The Willie B. Clay Inspirational Choir, under the direction of Brenda E. Sims-Thomas, has been in existence for over 35 years. Formerly known as the Inspirational Choir, they renamed the choir after the untimely death of one of their former Pastors, Rev. Dr. Willie B. Clay Sr. who was also their for District Superintendent in the Southern District of the Northern Illinois Conference of the United Methodist Church. 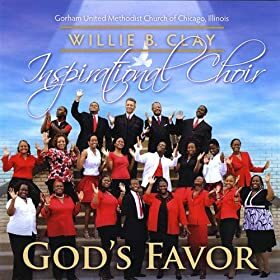 The Willie B. Clay Inspirational Choir recorded their first CD in 2008…“God’s Favor” and also was the recipient of Verizon Wireless “How Sweet the Sound” Gospel Award of “Church Choir of the Year”. It is our prayer, that “God’s Favor” minister to you. You can check the CD out at cdbaby.com, Amazon.com or purchase on ITunes. Choir Rehearsal – Tuesdays – 7:00 p.m.